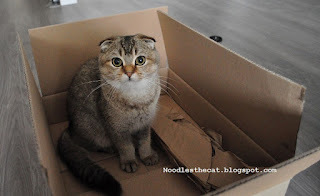 I IZ NOODLES THE CAT: What? I should think outside the box? What? I should think outside the box? Humanz are talking about thinking outside the box. I don't understand! Why should you think outside a box? I get my best ideas inside the box.